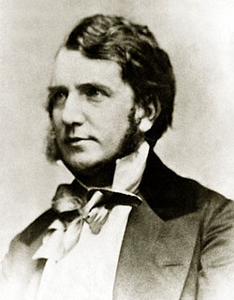 Joseph Sheridan Le Fanu was born in Dublin in 1814. His work was very popular in Victorian times and he has been called the father of the modern ghost story. Carmilla first saw print in 1871 and is believed to have influenced Bram Stoker when he wrote his own Vampire novel, Dracula, in 1897. Stoker’s short story Dracula’s Guest, which was published in 1914, two years after his death, is believed to have been a deleted chapter from Dracula and pays an indirect compliment to Le Fanu by being set in one of the same locals referred to in Carmilla. Upon a paper attached to the Narrative which follows, Doctor Hesselius has written a rather elaborate note, which he accompanies with a reference to his Essay on the strange subject which the MS. illuminates. This mysterious subject he treats, in that Essay, with his usual learning and acumen, and with remarkable directness and condensation. It will form but one volume of the series of that extraordinary man’s collected papers. I was anxious on discovering this paper, to reopen the correspondence commenced by Doctor Hesselius, so many years before, with a person so clever and careful as his informant seems to have been. Much to my regret, however, I found that she had died in the interval. She, probably, could have added little to the Narrative which she communicates in the following pages, with, so far as I can pronounce, such conscientious particularity. In Styria, we, though by no means magnificent people, inhabit a castle, or schloss. A small income, in that part of the world, goes a great way. Eight or nine hundred a year does wonders. Scantily enough ours would have answered among wealthy people at home. My father is English, and I bear an English name, although I never saw England. But here, in this lonely and primitive place, where everything is so marvelously cheap, I really don’t see how ever so much more money would at all materially add to our comforts, or even luxuries. My father was in the Austrian service, and retired upon a pension and his patrimony, and purchased this feudal residence, and the small estate on which it stands, a bargain. Nothing can be more picturesque or solitary. It stands on a slight eminence in a forest. The road, very old and narrow, passes in front of its drawbridge, never raised in my time, and its moat, stocked with perch, and sailed over by many swans, and floating on its surface white fleets of water lilies. Over all this the schloss shows its many-windowed front; its towers, and its Gothic chapel. The forest opens in an irregular and very picturesque glade before its gate, and at the right a steep Gothic bridge carries the road over a stream that winds in deep shadow through the wood. I have said that this is a very lonely place. Judge whether I say truth. Looking from the hall door towards the road, the forest in which our castle stands extends fifteen miles to the right, and twelve to the left. The nearest inhabited village is about seven of your English miles to the left. The nearest inhabited schloss of any historic associations, is that of old General Spielsdorf, nearly twenty miles away to the right. I have said “the nearest inhabited village,” because there is, only three miles westward, that is to say in the direction of General Spielsdorf’s schloss, a ruined village, with its quaint little church, now roofless, in the aisle of which are the moldering tombs of the proud family of Karnstein, now extinct, who once owned the equally desolate chateau which, in the thick of the forest, overlooks the silent ruins of the town. Respecting the cause of the desertion of this striking and melancholy spot, there is a legend which I shall relate to you another time. I must tell you now, how very small is the party who constitute the inhabitants of our castle. I don’t include servants, or those dependents who occupy rooms in the buildings attached to the schloss. Listen, and wonder! My father, who is the kindest man on earth, but growing old; and I, at the date of my story, only nineteen. Eight years have passed since then. I and my father constituted the family at the schloss. My mother, a Styrian lady, died in my infancy, but I had a good-natured governess, who had been with me from, I might almost say, my infancy. I could not remember the time when her fat, benignant face was not a familiar picture in my memory. This was Madame Perrodon, a native of Berne, whose care and good nature now in part supplied to me the loss of my mother, whom I do not even remember, so early I lost her. She made a third at our little dinner party. There was a fourth, Mademoiselle De Lafontaine, a lady such as you term, I believe, a “finishing governess.” She spoke French and German, Madame Perrodon French and broken English, to which my father and I added English, which, partly to prevent its becoming a lost language among us, and partly from patriotic motives, we spoke every day. The consequence was a Babel, at which strangers used to laugh, and which I shall make no attempt to reproduce in this narrative. And there were two or three young lady friends besides, pretty nearly of my own age, who were occasional visitors, for longer or shorter terms; and these visits I sometimes returned. These were our regular social resources; but of course there were chance visits from “neighbors” of only five or six leagues distance. My life was, notwithstanding, rather a solitary one, I can assure you. My gouvernantes had just so much control over me as you might conjecture such sage persons would have in the case of a rather spoiled girl, whose only parent allowed her pretty nearly her own way in everything. The first occurrence in my existence, which produced a terrible impression upon my mind, which, in fact, never has been effaced, was one of the very earliest incidents of my life which I can recollect. Some people will think it so trifling that it should not be recorded here. You will see, however, by-and-by, why I mention it. The nursery, as it was called, though I had it all to myself, was a large room in the upper story of the castle, with a steep oak roof. I can’t have been more than six years old, when one night I awoke, and looking round the room from my bed, failed to see the nursery maid. Neither was my nurse there; and I thought myself alone. I was not frightened, for I was one of those happy children who are studiously kept in ignorance of ghost stories, of fairy tales, and of all such lore as makes us cover up our heads when the door cracks suddenly, or the flicker of an expiring candle makes the shadow of a bedpost dance upon the wall, nearer to our faces. I was vexed and insulted at finding myself, as I conceived, neglected, and I began to whimper, preparatory to a hearty bout of roaring; when to my surprise, I saw a solemn, but very pretty face looking at me from the side of the bed. It was that of a young lady who was kneeling, with her hands under the coverlet. I looked at her with a kind of pleased wonder, and ceased whimpering. She caressed me with her hands, and lay down beside me on the bed, and drew me towards her, smiling; I felt immediately delightfully soothed, and fell asleep again. I was wakened by a sensation as if two needles ran into my breast very deep at the same moment, and I cried loudly. The lady started back, with her eyes fixed on me, and then slipped down upon the floor, and, as I thought, hid herself under the bed. I remember the nursery maid petting me, and all three examining my chest, where I told them I felt the puncture, and pronouncing that there was no sign visible that any such thing had happened to me. The housekeeper and the two other servants who were in charge of the nursery, remained sitting up all night; and from that time a servant always sat up in the nursery until I was about fourteen. I was very nervous for a long time after this. A doctor was called in, he was pallid and elderly. How well I remember his long saturnine face, slightly pitted with smallpox, and his chestnut wig. For a good while, every second day, he came and gave me medicine, which of course I hated. The morning after I saw this apparition I was in a state of terror, and could not bear to be left alone, daylight though it was, for a moment. I remember my father coming up and standing at the bedside, and talking cheerfully, and asking the nurse a number of questions, and laughing very heartily at one of the answers; and patting me on the shoulder, and kissing me, and telling me not to be frightened, that it was nothing but a dream and could not hurt me. But I was not comforted, for I knew the visit of the strange woman was not a dream; and I was awfully frightened. I was a little consoled by the nursery maid’s assuring me that it was she who had come and looked at me, and lain down beside me in the bed, and that I must have been half-dreaming not to have known her face. But this, though supported by the nurse, did not quite satisfy me. I remembered, in the course of that day, a venerable old man, in a black cassock, coming into the room with the nurse and housekeeper, and talking a little to them, and very kindly to me; his face was very sweet and gentle, and he told me they were going to pray, and joined my hands together, and desired me to say, softly, while they were praying, “Lord hear all good prayers for us, for Jesus’ sake.” I think these were the very words, for I often repeated them to myself, and my nurse used for years to make me say them in my prayers. I remembered so well the thoughtful sweet face of that white-haired old man, in his black cassock, as he stood in that rude, lofty, brown room, with the clumsy furniture of a fashion three hundred years old about him, and the scanty light entering its shadowy atmosphere through the small lattice. He kneeled, and the three women with him, and he prayed aloud with an earnest quavering voice for, what appeared to me, a long time. I forget all my life preceding that event, and for some time after it is all obscure also, but the scenes I have just described stand out vivid as the isolated pictures of the phantasmagoria surrounded by darkness.